initiation, metastasis, angiogenesis and drug response. Identification of master regulating ncRNAs in cancer and the underlying mechanism is challenging. My lab were capable of integrating the cancer genomics data and experimental validation to identify novel cancer-associated ncRNAs, modeling their down-stream regulatory network, and mechanistically validate their roles using cell line and mouse models. We first applied this strategy on the TCGA ovarian cancer dataset and functionally characterized seven master miRNAs for ovarian cancer EMT through regulating ZEB2 and SNAI2 (Cancer Cell, 2013). In gastric cancer, we successfully identified a key miRNA regulatory network for gastric cancer metastasis and poor overall survival by targeting ZEB1 (Clinical Cancer Research, 2014 and PNAS, 2015). In collaboration with Dr. Anil Sood, we demonstrated miR-200’s role in blocking ovarian cancer, lung cancer, and kidney cancer angiogenesis through direct and indirect mechanisms by targeting interleukin-8 and CXCL1 (Nature Communications, 2013). Using the multiple-dimensional data of 1019 ovarian cancer cases, we successfully uncovered functional targets of miR-506 as a novel tumor suppressor in ovarian cancer by regulating EMT (Cancer Cell, 2013), cell senescence (J Pathol, 2014), and HR pathways (JNCI, 2015). Yang D, Sun Y, Hu L, Zheng H, Ji P, Pecot CV, Zhao Y, Reynolds S, Cheng H, Rupaimoole R, Cogdell D, Nykter M, Broaddus R, Rodriguez-Aguayo C, Lopez-Berestein G, Liu J, Shmulevich I, Sood AK, Chen K, Zhang W. Integrated analyses identify a master microRNA regulatory network for the mesenchymal subtype in serous ovarian cancer. Cancer Cell. 2013 Feb 11;23(2):186-99. PubMed PMID: 23410973; PubMed Central PMCID: PMC3603369. Liu G, Sun Y, Ji P, Li X, Cogdell D, Yang D, Parker Kerrigan BC, Shmulevich I, Chen K, Sood AK, Xue F, Zhang W. MiR-506 suppresses proliferation and induces senescence by directly targeting the CDK4/6-FOXM1 axis in ovarian cancer. J Pathol. 2014 Jul;233(3):308-18. PubMed PMID: 24604117; PubMed Central PMCID: PMC4144705. B. Identified epigenetic and genetic alterations of ncRNA genes as biomarkers for cancer predisposition, diagnosis and prognosis. ncRNA, including both miRNA and lncRNA, have been demonstrated to have great potential as predictive, diagnostic and prognostic biomarkers in I received a thorough training in the screening of ncRNA biomar kers in cancer. 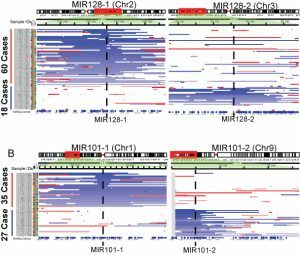 Through a comprehensive screening of the miRNA binding site SNPs in cancer, we demonstrate the SNP variant (rs1042538) that confers differential predisposition to breast cancer by influencing miR-124’s binding affinity to IQGAP1’s 3’-UTR. Using ovarian cancer patient plasma and TCGA miRNA expression data, we revealed that plasma miR-205 and let-7f are biomarkers for ovarian cancer early detection and prognosis. Moreover, we identified miR-506 DNA methylation as a novel biomarker for tumor poor prognosis and drug resistance. We further used the MIRACLE algorithm and successfully identified RAD51 as the functional target mediating miR-506’s regulation of ovarian cancer drug response (JNCI, 2015). Zheng H, Song F, Zhang L, Yang D, Ji P, Wang Y, Almeida M, Calin GA, Hao X, Wei Q, Zhang W, Chen K. Genetic variants at the miR-124 binding site on the cytoskeleton-organizing IQGAP1 gene confer differential predisposition to breast cancer. Int J Oncol. 2011 Apr;38(4):1153-61. PubMed PMID: 21318219. Zheng H, Zhang L, Zhao Y, Yang D, Song F, Wen Y, Hao Q, Hu Z, Zhang W, Chen K. Plasma miRNAs as diagnostic and prognostic biomarkers for ovarian cancer. PLoS One. 2013;8(11):e77853. PubMed PMID: 24223734; PubMed Central PMCID: PMC3815222. Liu G, Yang D, Rupaimoole R, Pecot CV, Sun Y, Mangala LS, Li X, Ji P, Cogdell D, Hu L, Wang Y, Rodriguez-Aguayo C, Lopez-Berestein G, Shmulevich I, De Cecco L, Chen K, Mezzanzanica D, Xue F, Sood AK, Zhang W. Augmentation of response to chemotherapy by microRNA-506 through regulation of RAD51 in serous ovarian cancers. J Natl Cancer Inst. 2015 Jul;107(7)PubMed PMID: 25995442; PubMed Central PMCID: PMC4554255. C. Successfully identified molecular markers and targets for cancer chemotherapy response. I am among the first researchers to demonstrate that BRCA1 and BRCA2 mutations lead to different genome stabilities and drug responses in ovarian cancer tumors. Using multi-dimensional genomic, epigenetic, and clinical data, we investigated the association of BRCA1/2 deficiencies, genome instability, and cisplatin responses in 316 serous ovarian cancer samples. This study led to the discovery that BRCA2 mutation was strongly associated with higher genome instability and improved chemotherapy response (JAMA, 2011). In gastric cancer, through tumor clonality analysis on whole-genome and whole-exome DNA-seq data, we successfully identified a lethal gastric cancer subtype that is characterized by high levels of intra-tumor heterogeneity (PNAS, 2015). Using whole-exome deep sequencing data, my group successfully characterized a “BRCAness” phenotype in BRCA wild type ovarian cancer tumors. Further integrative screening of potential driver molecular events of BRCAness revealed that RAD50 copy number deletion is a predictive marker for BRCAness and ovarian cancer drug responses (Gynecologic Oncology, 2016). Most recently, we build the first genome-scale data-driven approach for the identification of synthetic viable interactions in cancer genomics, which will facilitate to reveal the mechanism of cancer cell drug resistance (Brief Bioinform, 2017). Yang D, Khan S, Sun Y, Hess K, Shmulevich I, Sood AK, Zhang W. Association of BRCA1 and BRCA2 mutations with survival, chemotherapy sensitivity, and gene mutator phenotype in patients with ovarian cancer. JAMA. 2011 Oct 12;306(14):1557-65. PubMed PMID: 21990299; PubMed Central PMCID: PMC4159096. 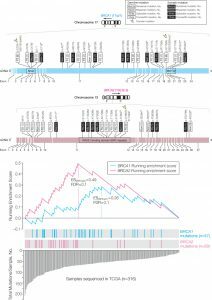 D. Designed and implemented novel strategy to identify driving ncRNA genes in cancer initiation and progression. It is conceivable that if some ncRNA genes are repeatedly targeted by somatic chromosome copy number alterations or DNA methylation in cancer samples, these ncRNAs may play an important role in cancer initiation and progression. This is analogous to the identification of cancer genes in the past several decades by screening for frequently altered protein-coding genes (e.g., EGFR amplification and DNA methylation of CDKN2A) in the cancer genome. In this regard, I have developed computational algorithms to understand how ncRNA expression is somatically interrupted in the cancer genome and epigenome during tumor initiation and progression. I have co-led the miRNA analysis in TCGA colorectal cancer, gastric cancer, low-grade glioma and melanoma working groups to characterize the miRNA regulatory network and subtype by using these methods. 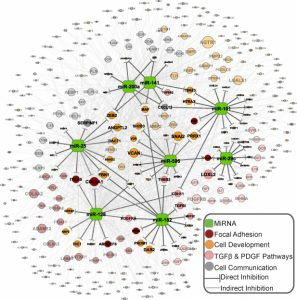 In TCGA colorectal cancer working groups, we comprehensively identified the somatic alterations of the miRNA post-transcriptional pathway and their impact on mature miRNA expression and the miRNA regulatory network. In the TCGA gastric cancer working group, we identified the miRNAs that are regulated by EBV-subtype and their downstream regulatory network. In the TCGA melanoma working groups, we successfully identified a miRNA-regulatory network driven by DNA methylation subtype (CIMP phenotype) using multiple-dimensional TCGA data. TCGA Network(including Yang D). Comprehensive molecular characterization of human colon and rectal cancer. 2012 Jul 18;487(7407):330-7. PubMed PMID: 22810696; PubMed Central PMCID: PMC3401966. TCGA Network(including Yang D). Comprehensive molecular characterization of gastric adenocarcinoma. 2014 Sep 11;513(7517):202-9. PubMed PMID: 25079317; PubMed Central PMCID: PMC4170219. TCGA Network(including Yang D). Genomic Classification of Cutaneous Melanoma. 2015 Jun 18;161(7):1681-96. PubMed PMID: 26091043; PubMed Central PMCID: PMC4580370. TCGA Network(including Yang D). Comprehensive, Integrative Genomic Analysis of Diffuse Lower-Grade Gliomas. N Engl J Med. 2015 Jun 25;372(26):2481-98. PubMed PMID: 26061751; PubMed Central PMCID: PMC4530011.